Standen Engineering will launch its very latest destoner at Cereals 2016. The new Standen Uni-PLUS has been developed to offer higher levels of output, precision and efficiency of stone and clod separation with its new chassis design, improved drive systems and upgraded component set based on proven design elements. Uni-PLUS will be available in different versions to suit all growing conditions and bed specifications, with a choice of the company’s unique double-action Stars over UnderWeb system with the option of a Front Web, or as an All Web machine with four separating webs. All Uni-PLUS models are available in 1700mm or 1500mm working widths. Star-UnderWeb models have heavy-duty shares; a powered intake roller followed by 10 rows of the company’s large diameter (320mm) aggressively angled stars, manufactured for the Uni-PLUS from an upgraded and highly durable polymer compound (PolyDure 856). The UnderWeb sieving web has been extended for additional separating capacity, and is offered with the option of an adjustable scrubbing web. Uni-PLUS All Web models are fitted with four large area sieving webs; with webs 1, 2 and 3 at equal lengths and interchangeable to help keep running costs low. The Standen Uni-PLUS is based on an all-new steel chassis to allow new increased efficiencies; improved serviceability with lower operating costs. The machine is set at an optimum, slightly steeper operational angle which has been shown to enhance performance. Uni-PLUS’s axle steering angle has been increased from 24 degrees to 30 degrees to enhance manoeuvrability. Standen engineers have also focused on driveline efficiency and ease of servicing; resulting in new Uni-PLUS being equipped with heavy-duty long life ‘V’ Belt drives capable of transmitting high power loadings with improved efficiency and a significant built-in safety margin. Easy access to areas requiring servicing is provided through large gas strut supported doors. Uni-PLUS destoners create high precision seed beds for potato and root vegetable growers to plant into, using accurate depth control and soil conditioning techniques to maximise the amount of fine tilth soil available. Standen Uni-PLUS destoners promote higher quality, more uniform crops, with improved skin finish and shape. Uni-PLUS options include a revised design VariFlow web for enhanced clod break-down and downhill operation. A hydraulically activated boulder box is also offered. 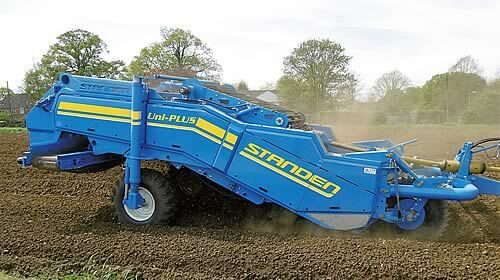 At Cereals 2016 the Standen team will be ready to take demonstration bookings as the company is keen to show off to growers, the exciting performance potential of the new Uni-PLUS destoner.